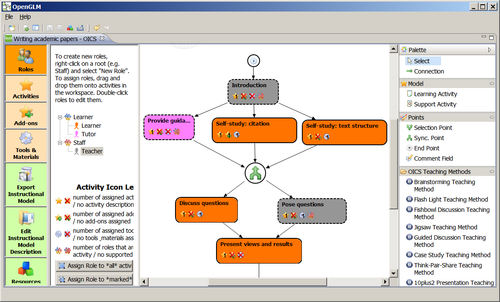 Brief description: Open Graphical Learning Modeller (OpenGLM) is an open-source learning design authoring tool which supports IMS Learning Design (LD) at levels A and B. The tool was conceived to facilitate non-IMS LD experts in creating, sharing and reusing units of learning. To achieve this, OpenGLM focuses on two features that differentiate it from most other IMS LD authoring tools. First, it adopts a visual modelling metaphor that conceals the complex and unintuitive elements and structures of IMS LD from the graphical user interface. Second, it provides built-in search, import and export access to an open repository which hosts more than 80,000 educational resources ranging from single learning objects to full online courses. About: Developed at University of Vienna, Austria.